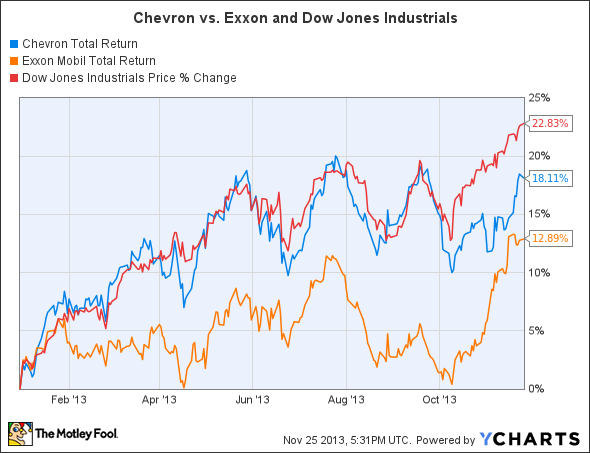 Chevron's gains have beaten out rival ExxonMobil, but the energy giant hasn't kept up with the Dow. Find out why. Energy giant Chevron (NYSE:CVX) has enjoyed a strong 2013, giving investors a solid 18% positive total return for the year and easily outpacing the 13% return that rival ExxonMobil (NYSE:XOM) has had this year. But the Dow Jones Industrials (DJINDICES:^DJI) have performed even better, with the average soaring almost 23% so far in 2013. What's behind Chevron's mixed performance, and how can it keep up its competitive position more effectively in the future? Chevron stands out from most of its peers not for what it has done but for what it has not. Rather than following the lead of many rivals by breaking up into component upstream exploration and production and downstream refining and marketing arms, Chevron and ExxonMobil have both remained integrated oil giants. By doing so, Chevron hopes to reap the best of both worlds, but its sheer size makes sustaining production and finding growth opportunities a constant challenge. Let's take a closer look at what moved shares of Chevron in 2013. Chevron Total Return Price data by YCharts. What's behind Chevron's results in 2013? As you can see above, Chevron has had an up and down year, following the Dow's downdrafts fairly closely. Yet in October, Chevron's returns disconnected from the Dow's bigger rise, and lagging Exxon posted a big comeback that eliminated half of the gap between its returns and Chevron's. One of the big issues that Chevron has faced all year has been the geopolitical situation around the world, especially in the Middle East. With the Syrian conflict ramping up throughout the year amid allegations of chemical-weapons use, the U.S. found itself on the brink of military action. But a diplomatic solution brokered by Russia to have Syria destroy its chemical weapons assets helped prevent oil prices from moving sharply higher. Just this past weekend, a preliminary agreement to the long-standing dispute about suspected Iranian nuclear-weapons activities sent oil prices plunging, as the easing of sanctions against Iran could resolve supply concerns. That might be good news for the economy, but it could lead to continued pressure on Chevron's revenue going forward if prices keep weakening. For Chevron specifically, though, continuing to find lucrative opportunities for production growth remains the biggest challenge. Chevron has generally done a better job than Exxon in making and developing major finds, with Australia being its major standout for massive natural-gas fields that it hopes to use to drive exports of liquefied-natural-gas to energy-hungry markets in India, China, and the rest of the geographically convenient Asia-Pacific region. Chevron also has eyed West Africa, the Gulf of Mexico, and South America for further development, as well as keeping a production presence in Iraq and Saudi Arabia. Chevron has looked beyond its traditional oil and gas business for opportunities. Like Exxon and Royal Dutch Shell, Chevron expects to invest heavily in its refining and chemicals businesses, hoping to take advantage of cheap feedstocks from independent oil and gas producers and diversify their overall exposure to the energy business. In particular, efforts to produce more ethylene and polypropylene could help Chevron serve the plastics manufacturing industry. As long as cheap energy is available, Chevron has the opportunity to take on these massive projects that are too large for small oil and gas companies. Finally, Chevron's ongoing legal battle over environmental contamination in Ecuador has been a multibillion-dollar distraction to its core business. Although Chevron managed to get an Ecuadoran court's original $19 billion verdict cut in half, the true test for the oil giant involves its U.S. federal court case alleging that the entire verdict should be nullified on the basis of fraud. Overall, Chevron stock has held up quite well given the less-than-perfect conditions in the energy industry over the past year. As long as Chevron can keep making global finds that are big enough to move the needle on its already huge business, it should be able to keep up with or surpass its Big OIl peers. Click here to add Chevron to My Watchlist, which can find all of our Foolish analysis on it and all your other stocks.